“They’ve actually got Holiday decorations in the supermarket, can you believe it, it’s only just October! ?” Every year it’s the same. One minute we’re enjoying light evenings and family BBQs, the next we’re unearthing scarves and complaining about Christmas songs in the shops. But for those of us working in the retail industry, planning for the peak season actually begins months in advance. Last holiday season it’s estimated that consumers in the US, UK, France and Germany spent more than €202 billion online alone. According to findings from our latest survey into consumer behavior, 53% of consumers carried out at least three quarters of their shopping online last year. And this figure is set to rise. 50% of 18-34 year olds said they plan to do even more of their holiday shopping online this year. In fact, shoppers in the US and the UK have the highest spend per household in the world, eMarketer estimates that last year’s holiday spend amounted to €1,203 (US) and €946 (UK). That’s a lot of gingerbread cookies or mince pies! But it’s not all bells and whistles at the climax of the retail calendar. In many cases, consumers are leaving retailer’s sites because they simply can’t find what they are looking for. 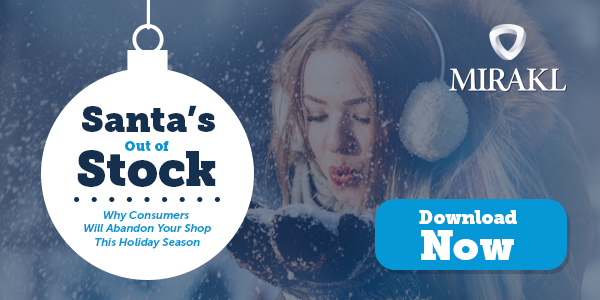 46% of US and UK shoppers found an item they wanted to be out of stock last holiday time. Understandably, 80% then went on to purchase the products at a competitors’ website. But what’s even more damaging is that 28% said this made them less likely to shop with that retailer in future. That’s over a quarter of your customers lost in a second! The retailers thriving in retail today are those that understand it’s all about supply and demand. Customers expect to visit your site, locate the item they want, checkout in seconds and have their item arrive at the door next day. Sounds simple right? It’s the Amazon effect. By leveraging a network of sellers, Amazon are able to GUARANTEE a product is never out of stock. Not only that, by stimulating competition between their sellers Amazon are able to offer continuously lucrative prices. For retailers, consider using your brand and website as the destination by which customers discover your product, but use distributors and sellers to stock and fulfil orders. The peak period now lasts from Halloween to mid-January. With more and more promotional days rising to prominence from Alibaba’s Singles Day to Boxing Day sales. It’s no longer just about Black Friday deals, consumers expect a bargain whenever they shop. Levelling out the peak spikes can be an effective way of managing stock inventory, ensuring you aren’t under or overstocked. Each holiday time a product comes to the forefront, selling in quantities no-one could have predicted. Last year it was the time of the fidget spinner. This year, who knows? What we do know is companies need to be agile and flexible. If we take a example from a leading retailer, like many others, Best Buy Canada was unprepared for the popularity of fidget spinners. Yet they managed to maximize on this sudden demand by adjusting their core inventory, they used the marketplace model to host over 200 fidget spinners in only days. Not only this, Best Buy were able to reduce any inventory risk in adopting the new product this way. Whatever your strategy this holiday season, the key to providing the best customer experience over this peak period is to ensure you are giving customers the choice they want by leveraging a network of sellers to quickly and easily expand your assortment - avoiding inventory and overhead costs. Customer’s are hitting your site in a buying frame of mind, make sure you don’t lose their loyalty because you’re out of stock.